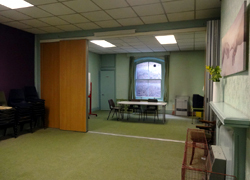 We have rooms and spaces that are available for hire on a one-off or regular basis. Please note NO ALCOHOL may be brought into or consumed on the premises. 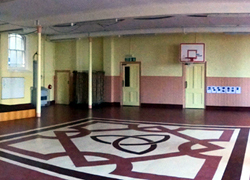 Large hall with a kitchen and serving area. Can accommodate seating with tables for up to 100 people. Can accommodate up to 180 people. Large room that can be divided into two spaces as required. Can accommodate up to 25 people and has an adjoining WC. 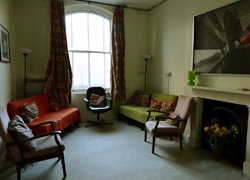 A comfortable room for smaller meetings and activities. We charge a range of rates because of our desire to promote activities which build community and serve the local core area in which our building is located. Standard Rate: for general application, including business and profit making ventures. Concessionary Rate: applies to charities/ non-profit making community groups (documentation of status is needed). This relates to groups or organisations that do not have external funding. A Deposit of between £50 and £100 refundable cash is payable on making the booking. The full fee is payable by cash or cheque 2 weeks before event. Electricity/ Gas: additional charges will be made for above average use of these e.g. bouncy castle generator or heating the Baptistry. 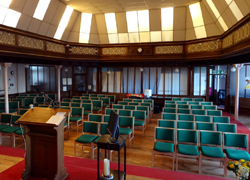 Baptistry: we suggest £100 to cover opening up and filling, heating water in addition to the rental fee for the Worship Area. Other Equipment: such as kettles or urns, flip charts, OHPs are also available at a reasonable rate. Rates for a combination of rooms can be negotiated. Annual / six monthly lets: for Local and Concessionary groups a special rate may be negotiated because of the benefit of having longer term tenants for budgeting and key holding. There is a 12 week probationary period before a person can become a key holder and then a deposit of £100 is required which is forfeited on loss of key. We conduct a six monthly review of all charges and terms in April and September. If you would like to know more about hiring part of the building for a one-off or regular activity we would be pleased to discuss this with you.